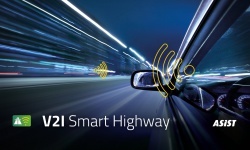 In September, Asist managed to successfully complete the V2I Smart Highway project, which offers a deployable real-time communication between vehicles and infrastructure, a new addition to the world of intelligent transportation systems (ITS). We are among the first in the world to implement a real-time communication system between vehicles and infrastructure (V2I, also V2X) into the real environment. The system keeps drivers informed of the state of the road in real time and allows reactions that lead to less congestion, less accidents, less stops and spinning, faster travel times and cleaner air; therefore, a comfortable, safe and economical driving experience. The project was co-financed by the Republic of Slovenia and the European Union from the European Regional Development Fund. The testings of the product / system were first carried out in a testing laboratory, where we established the entire infrastructure for simulating the real environment. When the operation of the individually developed components of the system was appropriate, the components were embedded into the real environment, on the highway just outside Ljubljana, Slovenia, at the south entrance of the Šentvid Tunnel, where we then performed continuous tests in terms of the proper functioning of the communication and responsiveness of the system in real time. In Asist's Youtube channel you can also check our videos that represent the V2I Smart Highway project. In September 2018 Asist has successfully completed the tests and confirmed the completion of the V2I Smart Highway project. We are extremely pleased with results and we look forward to future presentations to the wider circle of interested public and marketing activities; hoping for responsible stakeholders to the widest extent to recognize the advantages of the system. Development of new technological solutions and preparing all corresponding dissemination and marketing materials.